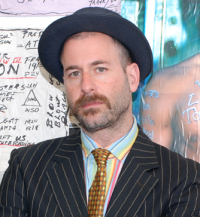 Kenneth Goldsmith's writing has been called some of the most exhaustive and beautiful collage work yet produced in poetry by Publishers Weekly. Goldsmith is the author of ten books of poetry, founding editor of the online archive UbuWeb, and the editor I'll Be Your Mirror: The Selected Andy Warhol Interviews, which is the basis for an opera, "Trans-Warhol," premiered in Geneva in March of 2007. An hour-long documentary on his work, Sucking on Words premiered at the British Library in 2007. From 1996-2009, Goldsmith was the host of a weekly radio show on New York City's WFMU. He is a senior editor of PennSound, the online poetry archive here at Penn. He held the The Anschutz Distinguished Fellow Professorship in American Studies at Princeton University for 2009-10 and received the Qwartz Electronic Music Award in Paris in 2009. In 2011, he co-edited, Against Expression: An Anthology of Conceptual Writing (Northwestern University Press) and published a book essays, Uncreative Writing: Managing Language in the Digital Age (Columbia University Press). In May 2011, he was invited to read at The White House for President and Mrs. Obama's "A Celebration of American Poetry." Goldsmith will participate in dOCUMENTA(13) in Kassel, Germany, 2012. In 2011, dOCUMENTA(13) published his book Letter To Bettina Funcke as part of their 100 Notes - 100 Thoughts. In 2013, he was appointed the Museum of Modern Art's first Poet Laureate.